he VAS Citation Sound One Phono Stage + Preamplifier is a treat for any audiophile. A close inspection to the detail, build quality and functionality will impress even the most discerning critic. 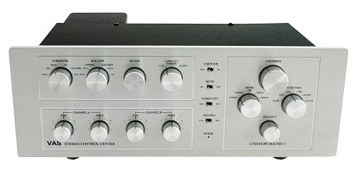 Rare to any component, this linestage has separate Bass and Treble step-type tone controls for each channel. There?? even a Blend control for a center channel! This is an audiophile’s dream component and will form the heart of a great system in two, three or multi-channel arrangements.